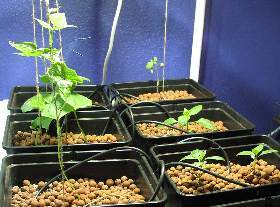 This page will introduce you to the 4 simplest and most basic of hydroponic setups. Although easily and cheaply built, they are very efficient at growing an impressive array of fresh vegetables... or whatever other plants you might fancy. We explain and diagram each process so you understand how it works. Then we provide free plans so you can build your own 1-6 plant setup. This will "get your feet wet" as you learn the basics of hydro. Later, we'll provide in-depth instructions for a bigger and better system. You can use some of the materials and equipment from your first project when you get ready to upgrade. Please read all about the mini-farms first, they explain clearly how the systems work. If you want to skip right to a full-sized garden, here you go: U-Build-It. Now, on to the DIY plans. We suggest you explore all four of them before deciding which one would be best for your needs. 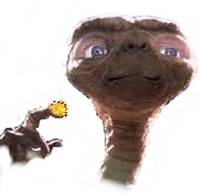 Each system has its pros and cons, and what you want to grow will be a big deciding factor. 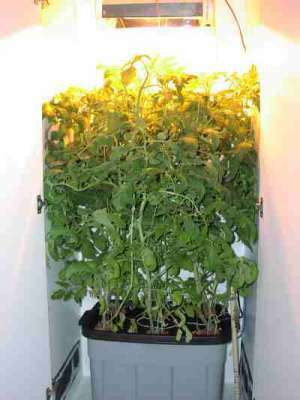 Ebb & flow hydroponic setups are quite versatile for a variety of plant sizes. You can fill the flood tray with both large and small pots. So with this arrangement, you could put large specimen plants like tomatoes, peppers, eggplants, broccoli or cabbage in large pots. Then you could also include several smaller pots for lettuces, herbs, greens, etc. Top drip Dutch Bato buckets are most effective for the larger crops as listed above. However, you can put multiple smaller plants into one bucket, like four heads of romaine lettuce. Once these are set up, they are easy to use and quite prolific. The lettuce raft would make a great hydroponic science project for a child. Take an old 5 or 10 gallon aquarium and float a raft in it. The root system is visible and makes for a great display. The lettuce raft is one of our favorites. Operation couldn't be simpler; you float a raft on a sea of nutrient solution. It's so much fun to watch lettuces drop down their roots and take off! The lettuce raft is also a good choice if you have children in the home and want them to learn about Hydro. It's easy for them to see how the roots expand and dangle in the grow juice. Autopots would be a good choice for specimen houseplants or perennial fruits like a miniature lemon tree. They are quite expensive but once put in place, provide a good permanent base for specimen plants. Also a great choice if you travel a lot, as they are self watering by gravity and will not stop if the power goes off. EBB & FLOW (FLOOD & DRAIN) A classic. Simple and basic yet highly effective. 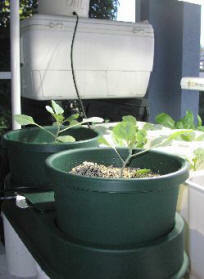 TOP DRIP SYSTEM (WITH BATO® BUCKETS) The most widely used hydroponic setup for commercial greenhouses. DEEP WATER CULTURE ("LETTUCE RAFT") Good clean fun! WICK SYSTEM (WITH AUTOPOTS®) The lazy gardeners best bet. At last! 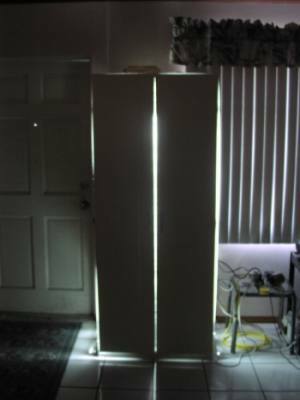 Plans for a closet grow-box and hydro bubbler system: Hydroponics Grow Box.